← Stigmatize gun ownership like smoking? Very sensible comment. I think a lot of conservatives assume that the rest of the world (which for them is the United States) is pretty much like the people who go to their church. We generalize from our own experience. But to win, conservatives have got to understand the concerns of ordinary people who are NOT white, older, well-off, reflexively religious. And they must speak to those concerns. I would really hate to have to make the choice between a moderate Democrat who believes in science, and someone like the ignoramus that Karl Rove wants to defeat, even though the ignoramus is a conservative. Always good to hear from you Doug. I found out that the candidate, Broun, is a M.D. I don’t care about his actual views on creation as much as how he expresses them–particularly in a public setting. As a practical political consideration, it’s pretty difficult to get elected to high office after making such an inflammatory remark. I wish him luck if he wins the primary. What ultimately matters is that you can win the election, and work well with the caucus. I would like to know what you consider to be living a “shadow existence” when numerous illegal immigrants (certainly not all) benefit from various government programs and subsidies, and when so many can be easily found, whether in California, or Texas, or any number of other states, waiting near a high traffic area for someone to come offer them a cash-only job where they’ll not have to pay taxes. The only time they go into the shadows, so to speak, is when they get the notion that we might actually enforce our immigration laws. I also fail to see how such a calculated existence is inhumane, since these people can leave just as easily as they came. Again, this is all a calculation on their part that they can make a living here without following our laws. I’ll admit that I know nothing of the particulars of the current reform talks, but based on what we’ve seen in the past from both sides, I’ll remain skeptical of any legitimate reform taking place and even more skeptical that any enforcement will happen. Reform does need to happen, and I trust Rubio to be a voice of reason, but I can’t blame Republicans for crying RINO when we have the gutless wonder of John Boehner leading the way, along with many others who tend to cave to liberal pressure before they even begin negotiations. Nice link. I don’t want to indulge the sob story that immigration enforcement leads to skipped karate classes. I didn’t have fraudulent access to health, education, and other government benefits in mind, but I think that should be punished. The main concern when I refer to shadow existence is the danger arising from illegals’ hesitance to contact authorities when they should. Some examples include a domestic violence victim, a neighborhood under the thumb of organized crime, children living in overcrowded homes, and workers extorted by their bosses. These situations can entail spillover effects of disease or crime to legally residing neighbors. True, the adults understood the risks, but the children, “Dreamers,” remain a salient moral factor. Americans collectively suffer indignity when the rule of law does not reach everyone within our sovereign borders. In that sense, the situation is inhumane. As I’ve mentioned, I think deporting or otherwise coaxing 11 million illegals to leave is logistically impractical and disruptive to our economy. So we need some fresh thinking when approaching reform. 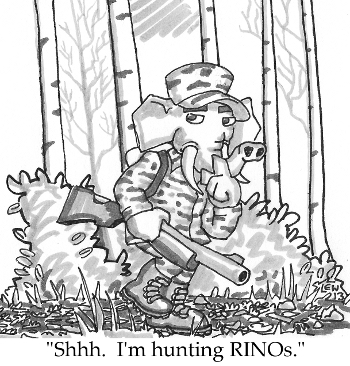 As for calling someone a RINO, I think the description could be appropriate to some Republicans, depending on the details. But broad brush namecalling is not as helpful as spelling out the actual error. True, true. All valid points. I would disagree on the one point of economic disruption in the hypothetical case of all of the illegal immigrants leaving (whatever the cause). Sure there would be some minor disruption, but there are enough legal migrant workers, and people who just want a job, that there really shouldn’t be much of a change. The price of lettuce and some other produce might tick up a bit, but it would be minimal. Really, the spike in oil prices every summer has a larger impact than I would expect from a complete lack of illegal work. So assuming that the economy can stand such a change, I also think it is a falsehood to claim that the current thinking is either to deport everyone or “coax” them to leave wilingly. Those in themselves are not the final solution, but how can we expect to make progress towards a comprehensive solution when our current government is failing at both enforcement of current laws and discouraging additional illegal immigration? I think that if our government was seriously addressing those two areas, both deporting people known to be here illegally and removing the incentives for living here illegally, you’d see a lot more conservatives willing to negotiate on what to do with those people already here. But to come to some kind of deal before then threatens to be another 1986, even if it does not include amnesty. Without the first two pieces in place, reforms just make this country an even greater magnet.